If you have had a root canal done, then it was hopefully a more positive experience than you originally thought it was going to be. A root canal doesn’t have to be painful. You will likely experience about the same level of discomfort as when a cavity is treated. A root canal is required when your tooth develops an infection. 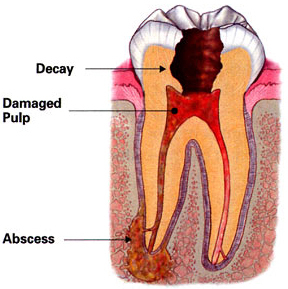 The pulp of the tooth becomes infected when tooth decay gets inside it. Your body fights infection differently than your tooth does. In the body, when an infection is present, it sends white blood cells to fight off the infection. You may see some swelling in the area which is a sign that your body’s natural defense mechanisms are working. But inside a tooth those same defenses don’t work because the tooth is a restricted space. The tooth will try to swell but there is nowhere for it to go, so the tissue dies. At this point, the pain in your tooth may actually go away. That doesn’t mean that the infection is gone. What happens is that the dead tissue moves into your bone causing an absess. You can see this process illustrated in the diagram to the right. A root canal treatment must be performed to save the tooth. This treatment actually heals the tooth by removing the infected tissue. The overall structure of the tooth may be weakened so a dental crown will likely be put in place to seal and protect it. Under most circumstances, a root canal is not painful for the patient. When the pulp is dead, only a local anesthetic will be needed to numb the area. If you are particularly anxious or nervous, we offer sedation dentistry techniques to put you at ease. With oral sedation you will be so relaxed that you may not even remember your appointment. We will do everything we can to save your tooth with a root canal. So we encourage you to call us immediately if you experience any of the following symptoms, as they may be signs of a tooth infection. And if you call promptly, in some cases it could be possible to avoid root canal treatment all together. If you think you have a tooth infection, please give us a call right away at 225-292-4321. A tooth extraction is more traumatic than having a root canal.